South Carolina? you may ask. Sacrifice? you may wonder. What were troops from Delaware doing in South Carolina, and why does this battle merit our attention over two hundred years later? Preparations: At Rugeley's Mill, SC, the Continentals were joined by 2,000 militia from North Carolina and 700 militia from Virginia [Ward]. Gates planned to mount an attack on the British camp -- 1,400 regulars and 400 militia at Camden, South Carolina, 10 miles to the south [Ward]. Because the army had no rum, Gates ordered that each man be given a gill of molasses with dinner the night before the battle. Unfortunately, the molasses was spoiled, and the troops suffered considerably from diarrhea as they marched southward. First Contact: The march started at 10 PM; the air was hot, and there was no moon. At 2 AM of August 16 the lead elements bumped into the British army, which had developed a similar plan for a surprise attack and was marching north. After a brief firefight, during which Col. Porterfield of the Virginia Light Militia was killed, they drew apart and waited for dawn. Occasional gunfire from skirmishes prevented the troops from getting any sleep. Disposition of Troops: The battlefield was several hundred yards across and flanked on both sides by thin and swampy pine woods. The Americans were on slightly higher ground and arranged in four groups. On the left (as we face them - to the north) were the Continental veterans -- 280 men of the Delaware Regiment and 350 men of the Second Maryland Brigade. In the center were 1,600 militia from North Carolina. On the right were 700 militia backed by 120 dragoons (mounted infantry) from Virginia. Behind the center were the 350 men of the First Maryland Brigade, held as a ready reserve. Gen. Gates command post was behind this, and the 170 wagons of the baggage train were in the rear. Facing the 2,300 colonial militiamen and 120 mounted infantry were Webster's 600 experienced light infantry and 500 Irish volunteers, backed by Tarleton's 200 cavalry. Facing the 630 Continentals (backed by the 350 Continental reserve) were Rawdon's 500 infantry and a reserve of 400 loyalist North Carolina militia. Attack on and Rout of the Militia: At the start of the battle, both the British and American forces advanced. The Virginia militia, who had never before seen battle, faced experienced British troops, including light infantry. As the British charged, this militia panicked and fled into the woods. Most of the North Carolina militia similarly broke and fled through the First Maryland Brigade, pursued by the British cavalry. Many in the militia abandoned their muskets so as to run faster. At this point Gen. Gates mounted a fast horse and fled the field -- a shameful action for which he was later removed from command. Col. Smallwood of Maryland also abandoned the field of battle at this point, leaving the reserves without senior leadership. The British troops rolled up the flank of the regiment of North Carolina militia who had not fled and cut them off from the Continentals, killing 100 and capturing several hundred more. The British cavalry swept on past the fray and captured the entire baggage and ammunition train (a total of 170 wagons), then returned to the field and attacked the reserve troops. Overwhelming the Staunch Continentals: Meanwhile, the Delaware Regiment and the Second Maryland Brigade had pressed forward in good order, capturing 50 of the British troops. When the North Carolina militia began to crumble, Gen. de Kalb called for the reserves. However, although the First Maryland Brigade had reformed their ranks under the direction of Adjutant General Otho Williams, the British poured into the gaps presented by the retreating Americans and swept away the reserves. About 2,000 British troops then surrounded 600 Continentals in several groups. The brave deKalb rallied the men for several bayonet charges before they were overwhelmed. 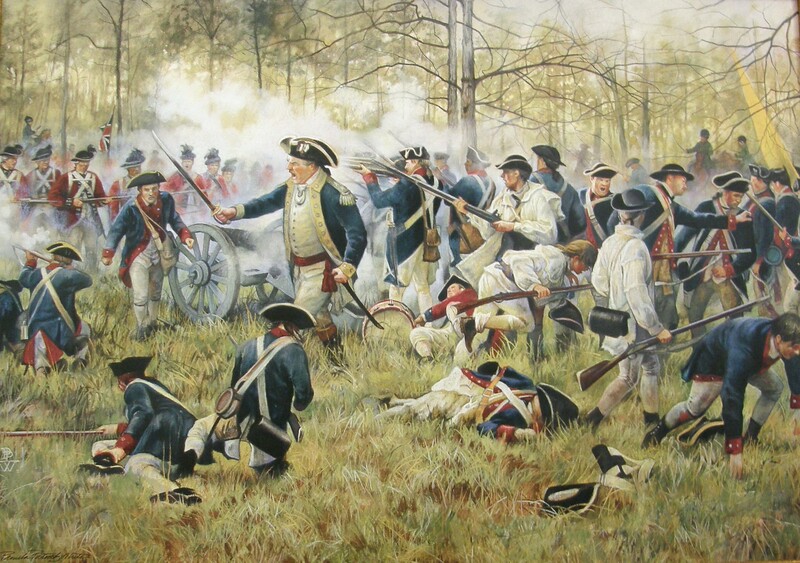 DeKalb fought vigorously and suffered 11 wounds before he fell to the ground, mortally wounded. He died three days later in the British camp at Camden. The town at the site of the battle is named DeKalb SC in his honor. One group of about 60 (including Captain Kirkwood) fought their way out, and a few others escaped individually by fleeing through the swamp; the remainder died or were captured. The battle lasted about 45 minutes. It was the worst defeat suffered by the American Army during the Revolutionary War. About 50% of the Continentals and 13% of the American militia were either killed or captured, compared with only 4% of the British troops. About 20% of the Delaware Regiment (50 men) were killed [DESSAR estimate based on those listed as MIA] and 30% (72 men) were taken prisoner [Seymour], including six of the officers -- Lt. Col. Vaughan, Major Patten, Captains Rhodes and Learmouth, and Lieutenants Duff and Purvis -- and 66 soldiers [Seymour]. It took several weeks before the lost and demoralized men were once again collected into fighting units. Although half of those who had been taken prisoner were re-captured four days later, the Delaware Regiment was so decimated that it was reformed into two companies (under Captains Kirkwood and Jaquett) and merged into a Maryland regiment for the rest of the war [Ward]. In the grander scheme of things, the defeat at Camden was only a momentary setback. The surviving troops regathered, were re-equipped, and in a year had driven the British back into Charleston and Savannah. The siege of Yorktown VA began in September of 1781, and Cornwallis surrendered on October 19, effectively ending the war. The lessons we learn from this battle are that Delawareans responded to the cause of freedom, not only near home, but far away. They fought bravely while facing great odds, and persevered to win back the ground they lost. At the end of the war the remaining 120 Delaware Continentals marched 700 miles home from South Carolina -- 33 of them having served and survived the entire war. The Delaware Society encouraged the state of Delaware to erect, in the Revolutionary War section of the historical park in Camden SC, a bronze marker inscribed with the names of the Delaware Continentals who died for liberty and independence at the battle of Camden. The Maryland Society has placed a similar marker there. We hope that the memory of the sacrifices made in this battle will inspire people to renew their commitment to speak out, to vote, to set good civic examples, and to do the work required to maintain liberty and independence in their communities, states, and nations. "A Journal of the Southern Expedition (1780-1783)", by William Seymour, paper XV in Vol. 2 of Historical and Biographical Papers (Historical Society of Delaware, Wilmington DE, 1896) -- LC catalog number F161.3 / H67. "The Revolutionary Soldiers of Delaware" by the Hon. William G. Whitley, paper XIV in Vol. 2 of Historical and Biographical Papers (Historical Society of Delaware, Wilmington DE, 1896) -- LC catalog number F161.3 / H67. "Muster Roll of the Non-commissioned Officers, Drummers, Fifers, and Rank and File of the Late Delaware Regiment" (no date given, but notes losses from the battle of Camden), p 1265ff in Delaware Archives Military Vol. 3, the Public Archives Commission of Delaware (Storey Press, Wilmington DE, 1919). Delaware Heritage - The Story of the Diamond State in the Revolution, by Charles E. Green (privately published, Wilmington DE, 1975) - LC # E263.D3 / G74 - pp 126 ff. Delaware, the First State, by Carol E. Hoffecker (Middle Atlantic Press, Wilmington DE, 1988) - LC # F164.3 / H64 - Chap 10. Battleground of Freedom - South Carolina in the Revolution, by Nat and Sam Hillborn (Sandlapper Press, Columbia SC, 1970) - LC Card 70-143042 - Chap X and map on p 137. A Battlefield Atlas of the American Revolution, by Craig L. Symonds, (Nautical and Aviation Publ. Co., Baltimore MD, 1986) p 86-87. The Delaware Continentals, by Christopher L. Ward, Jr. (Hist. Soc. of Delaware, Wilmington DE, 1941) - LC# F168.1 / W25D - Chaps 38 and 39 and map on p 347.